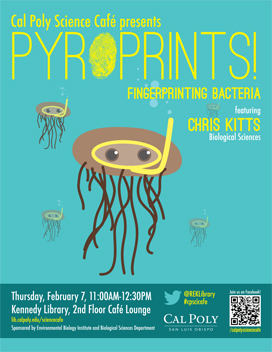 Hear stories from Professor Chris Kitts and third year biology student Maria Zuleta Alvarado about their adventures collecting local E. coli data for the Cal Poly Library of Pyroprints (CPLOP). The database is intended to be a searchable, online library and lower-cost resource for tracking E. coli to help researchers understand who or what is polluting the water. Then, brainstorm with the researchers about ways to collect wildlife “samples” that include origin confirmation. It’s one of their greatest challenges! Professor Kitts received the Distinguished Scholarship Award for 2011-2012. His areas of expertise and interest include: biodegradation, microbial ecology of intestines, microbial ecology in bioremediation and spore forming bacteria in milk powder. Already Thursday! It's 2:42pm right now.